What do expats, snowbirds, Norteños and extranjeros do for fun in Oaxaca [besides learning Spanish]? 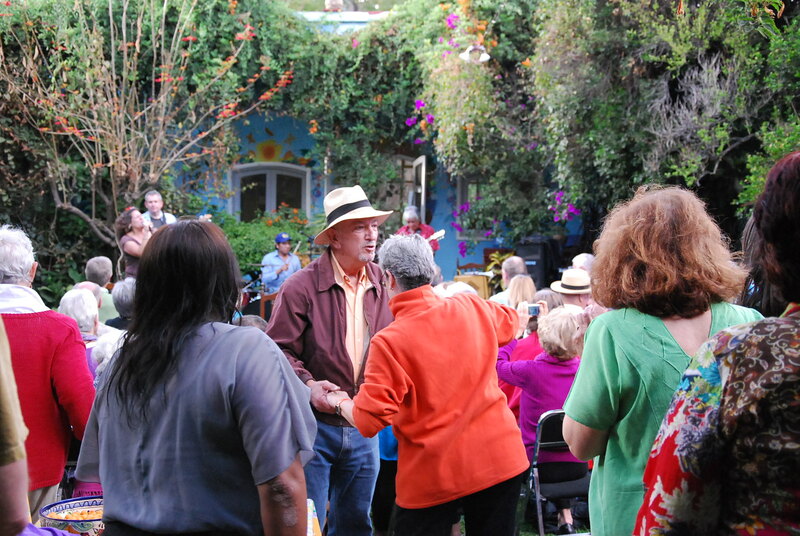 The Sunday afternoon concerts hosted by Jane Robison at Casa Colonial are one way to get together, shake-shake-shake to 60’s and 70’s classic rock, drink Margaritas, swill some Victoria, slurp an agua de jamaica and support the good work of the Oaxaca Lending Library. Admission: 60 pesos. 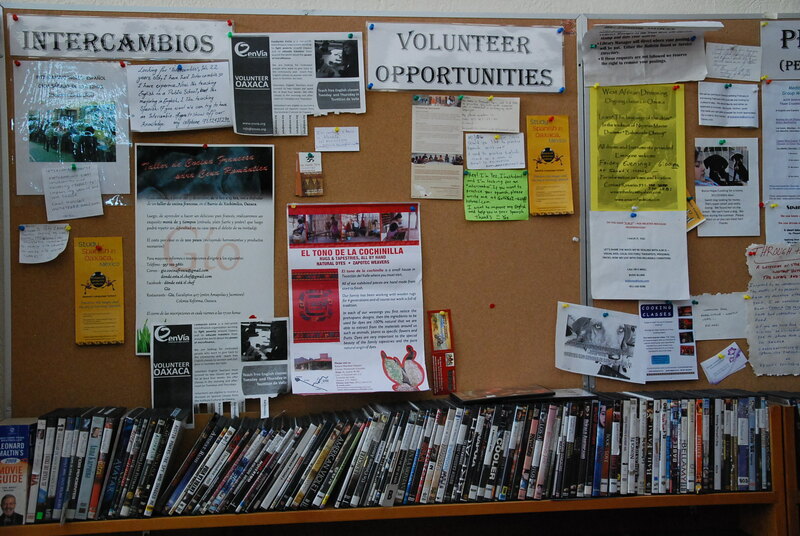 Contact the Oaxaca Lending Library for schedule! 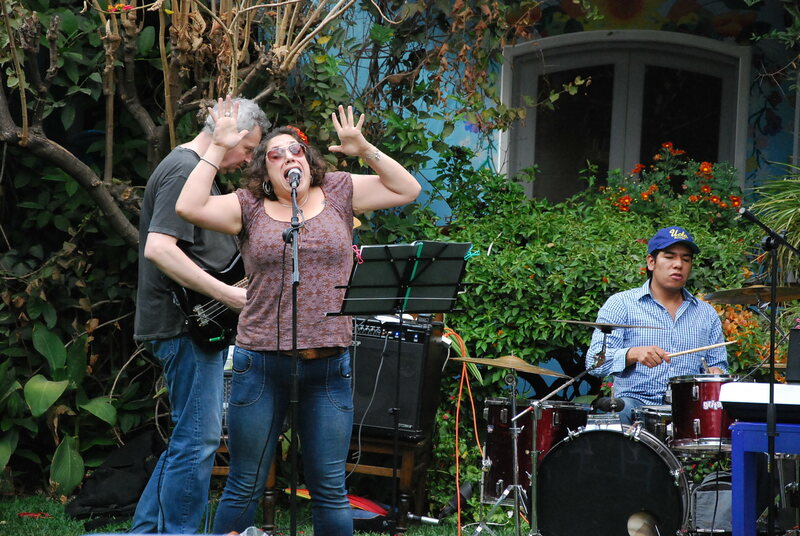 Mick Jagger could learn a few things from Kimberly Reyes [on vocals and percussion]. Her trained voice is clear with great range and she can really move, inspiring the crowd to get up and dance. And, we did! On The Rocks organizer Kurt Hackbarth on keyboards is a playwright and author who has a work in production in the city. He also teaches playwriting in Spanish to local aspiring writers. Electric bassist Bill Stair hails from the U.K., Oaxaqueño Luis Santos is on drums, and electric guitarist is Rafael Gonzålez Lumbreras is from Mexico City. The band definitely represents the multiculturalism that makes Oaxaca so great. 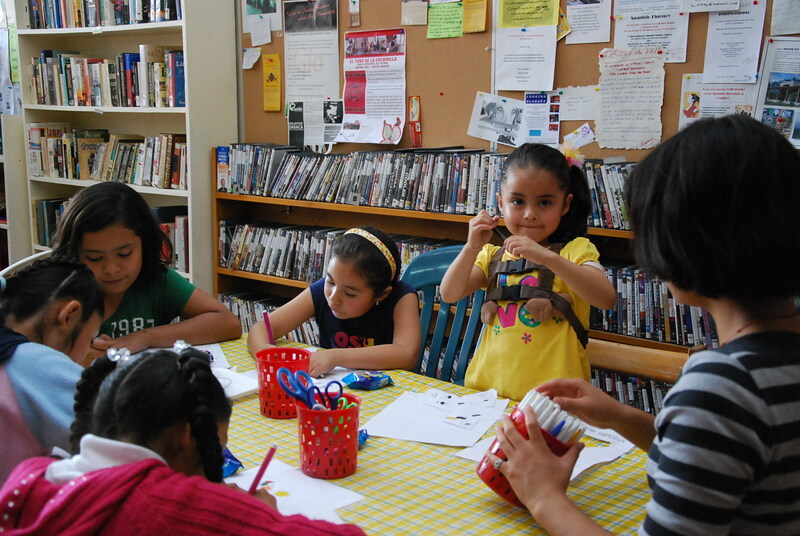 On Saturday mornings the Oaxaca Lending Library is a hub of activity. 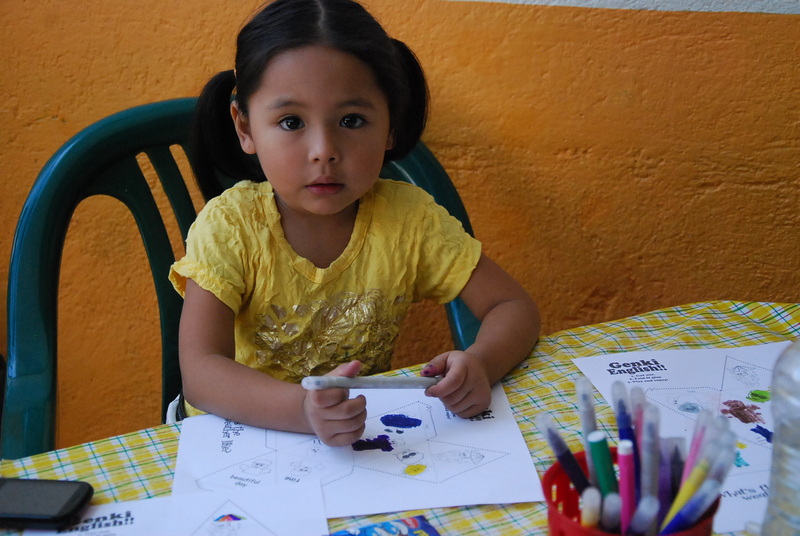 Children gather around tables to learn English using hands-on coloring tools, coached by volunteers and parents. Adults are in dyads to talk back-and-forth in English and Spanish, locals teaching visitors and vice versa. 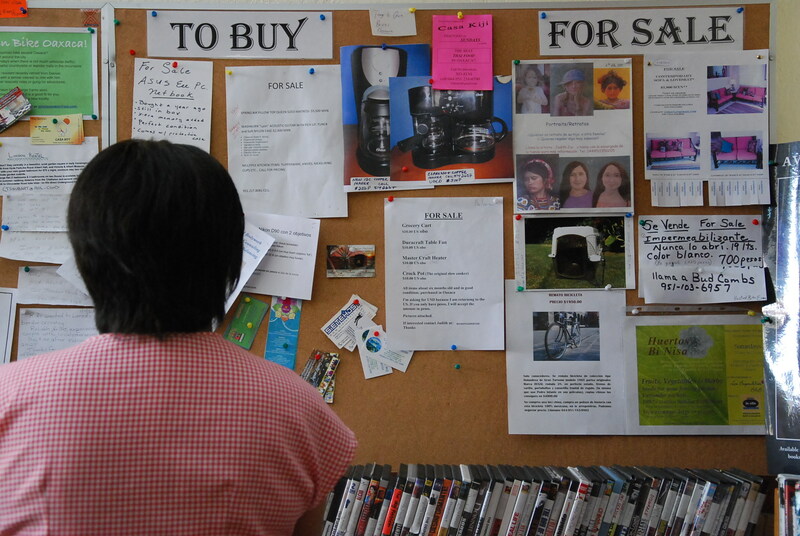 The Library is also an extraordinary resource for jobs, volunteer opportunities, things for sale or wanted to buy. 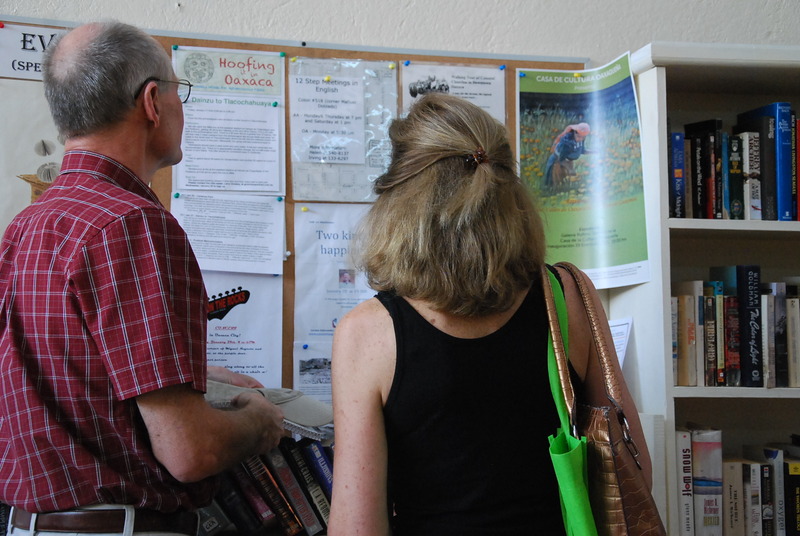 Workshops, trips and event posters cover the bulletin boards. A complete library of books, videos and CDs in Spanish and English are available, too. Along the edge of the room, young mothers hold newborn infants close to them, swaddled tightly. Education is central to the OLL mission and extranjeros seem to enjoy supporting this while having a good time, too. Oaxaca Lending Library, Piño Suarez near Llano Park. 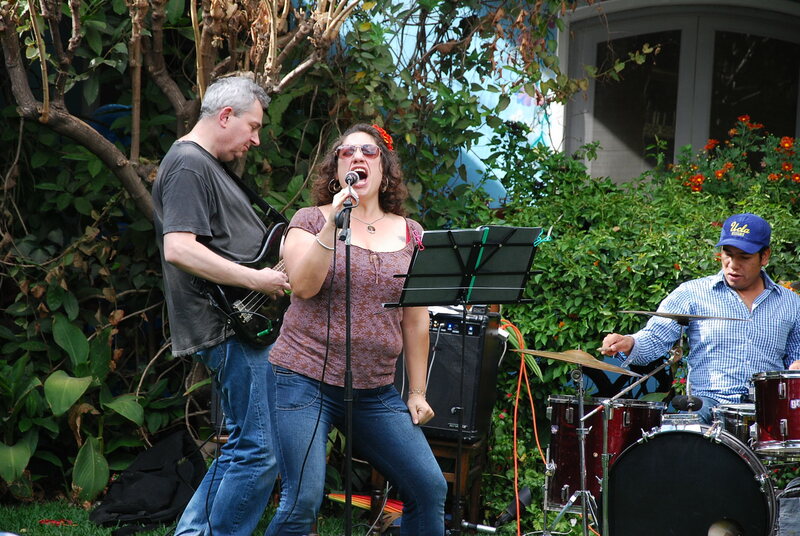 On The Rocks, classic rock band for hire, contact Kurt at (951) 203-2749 or Kimberly at (951) 513-5574. Casa Colonial, Miguel Negrete #105 at the corner of Division Oriente (extension of Morelos), house with the purple door. This is a magnificent hacienda on incredible grounds covered with old growth bougainvillea, agave, cactus and shade trees, filled with original Oaxaca art by some of the now deceased folk masters, and a comfy living room with a complete library in English and Spanish. The Swiss mining engineer who built the adobe hacienda long ago framed the fireplace with mineral rocks. Owner Jane Robison opens the Casa to support community endeavors. Biological Evolution vs. Intimate Relationship: How We Are Wired & Why That Makes Living Together Complicated is the subject of a talk by Stephen Hawthorne, LCSW, scheduled for Thursday, June 23 at 5 PM at the Oaxaca Lending Library, Pino Suarez #519, Centro Historico, Oaxaca. The cost is 50 pesos (less than $5 USD). A Licensed Clinical Social Worker, Stephen Hawthorne has been on the faculty of Duke University Medical Center, Durham, North Carolina, since 1977. There he created the Department of Psychiatry’s first family therapy training program, where psychiatry residents and psychology interns receive coaching and education from faculty as they work with patients in a clinical setting. Mr. Hawthorne is in private practice in Chapel Hill, North Carolina, where he works with couples to improve their relationships. Hawthorne developed ABC Therapy that combines affective, behavioral and cognitive therapy models. This combined approach has the most promising outcomes for relationship improvement. If you are in Oaxaca next week, don’t miss this opportunity to learn more! The children’s limerick, “rain, rain go away, come again another day” is apropos to describe Oaxaca this summer. It has rained incessantly and our friends have said this is the wettest time they can ever remember. The ground is saturated. This makes mountain villages like Santa Maria Tlahuitoltepec especially vulnerable because there is no where else to build except on the hillsides. News from Tlahuitoltepec today is not good. In this Mixe village of about 10,000 people, a massive 4:00 a.m. landslide buried people inside their homes as they were sleeping. The remote village is about 50 miles from our village of Teotitlan del Valle (also about 10,000 pop. ), but it takes three to four hours to get there over curving mountain roads. 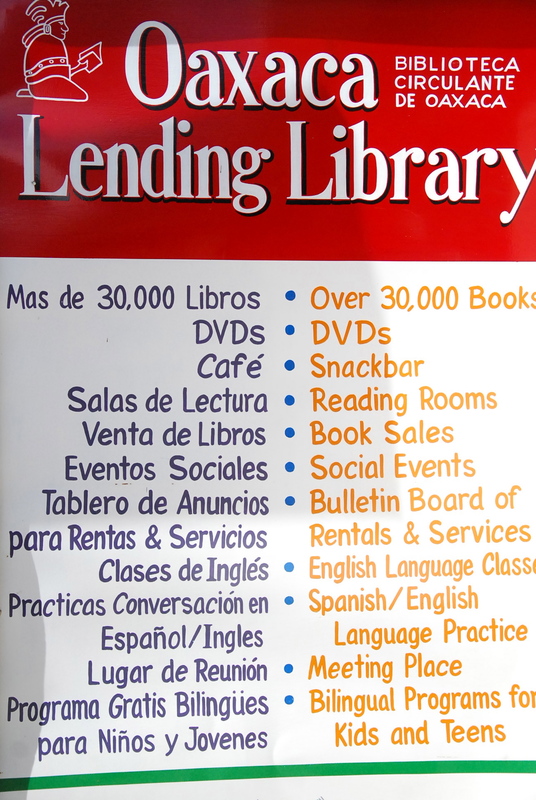 To help, contact Oaxaca Lending Library email: library@prodigy.net.mx Stephen and I are members of the Oaxaca Lending Library. They are an organization of local Oaxaquenos and expatriates who make Oaxaca their home. You can be assured that any gifts will get to the intended community directly — this is a legitimate organization.